The ViewPoint CK System used to perform the NearVisionSM CK® (Conductive Keratoplasty®) treatment), is the only FDA-approved technology that temporarily (2-5 years) improves near vision and can be conveniently performed in-office in just a few minutes. NearVision CK was ranked the #1 non-laser refractive procedure in the USA, according to Market Scope’s 2005 Survey of Refractive Surgeons, and is an effective, safe and minimally-invasive alternative for patients who may be apprehensive about laser vision correction surgery, and are seeking to reduce their dependence on reading glasses. Dr. Roholt is probably the most experienced CK surgeon in the country and has performed thousands of these procedures (off-FDA labeling*) to correct mild hyperopia and astigmatism, helping patients who need minor enhancement surgeries to reduce their dependence on glasses. The procedure can be performed for CustomCorrection™ after LASIK, PRK, or Multifocal implants after cataract surgery or refractive lens exchange (RLE). 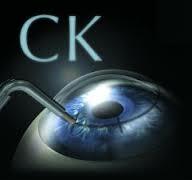 CK is unique in that it uses radiofrequency (RF) instead of a laser. It takes as little as three minutes and can be conveniently performed in-office using the ViewPoint® CK System. NearVision CK builds upon the principles of thermokeratoplasty, using radiofrequency (RF) energy to reshape the cornea and therefore adjust its refractive characteristics. To perform the procedure, a handpiece with a Keratoplast™ Tip delivers controlled RF energy directly to the internal corneal tissue in a ring pattern. The characteristics of the energy and the tissue’s consistent conductive properties make it possible for CK to achieve a reproducible, optimal tissue temperature for the critical time necessary to bring about the localized shrinkage of the collagen fibers. *Off-Label: An Off-label procedure is when the physician uses an FDA-approved device for uses other than the approved use (in the case of CK, it is approved to induce spherical myopia to treat Presbyopia or loss of near vision). Off-label procedures can be performed when the doctor believes it is in the best interest of the patient to do so. If you are interested in a consultation, contact Roholt Vision Institute today.